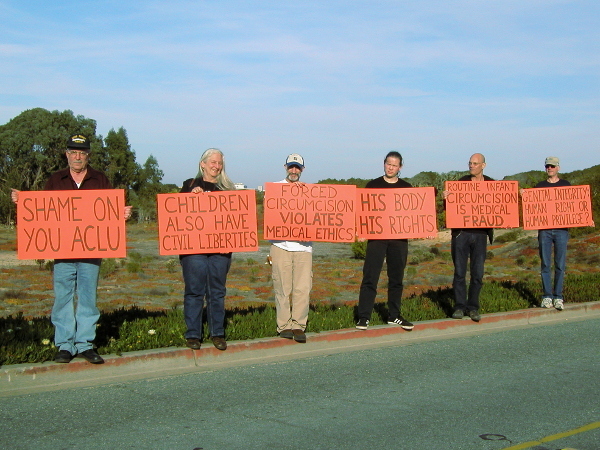 Tell the ACLU "Stop defending forced circumcision!" The American Civil Liberties Union of Northern California has organized a screening of "The Campaign", a documentary film on the fight for marriage equality, at The New Parkway starting at 7pm on Wednesday, July 17 in Oakland. Members of Bay Area Intactivists will protest outside the event venue to condemn the ACLU's work denying boys equal protection from genital mutilation. In 2011, the ACLUNC argued that the San Francisco Male Genital Mutilation Bill, a ballot initiative to restrict non-therapeutic circumcision to consenting adults, violated the parental right to subject boys to ritual circumcision in order to satisfy the religious beliefs of some parents. The ACLUNC lent its support in a lawsuit against the city of San Francisco to have the initiative (which received the support of over 12,000 San Francisco voters) removed from the ballot thus squelching democracy by denying voters their voice. Later that year, the ACLUNC endorsed AB 768, a state law which prohibits any city in California from protecting boys from forced, non-therapeutic circumcision. In response to outrage from the community over these actions of the ACLUNC, a representative from ACLU National defended the actions of its Northern California affiliate. Girls have been protected (without any religious or cultural exceptions) from genital mutilation since 1997 by US Federal law. Not only do the actions of the ACLUNC continue to deny men the right to control their own bodies, they also deny religious freedom by sanctioning the branding of children's bodies with the religious mark of others. Furthermore, male circumcision results in a permanently diminished sexual experience. The ACLU's work to enshrine forced circumcision is a severe blow to those fighting for sexual freedom. A limited number of signs will be available to those who wish to participate in the protest. You are also welcome to bring your own sign.